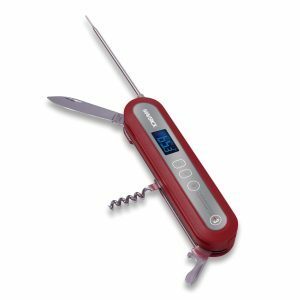 The Maverick PT-60 could be the perfect barbecue instant-read thermometer because of its functions and affordability. The cooking world offers a million different ways to measure the internal temperature. Upon our extensive research and using hundreds of these various offerings over the years we have condensed our must have’s in these thermometers to two simple criteria. One, does it actually work and two, how much does it cost. We have just finished up testing our the Maverick PT-60 Multi-Tool Thermometer, and we can tell you it got flying colors on both of our criteria questions. We received very accurate reads in just under four seconds on multiple different tests and did this is some pretty harsh environments. It also works as a bottle opener, simple flat head screwdriver, decent pocket knife, and a cork remover. It also reads temperatures from -4 degrees F to over 550 degrees F. It also displays Celsius if needed. The retail cost of this unit is set at $49.99 and compared to some other units we compared to will cost almost double and that’s without the other handy tools from this unit. We are sold on this unit and will have it in our toolkit as long as we don’t fly to an event as we have already lost one of these to TSA airport security officials as they see it as a weapon because of the knife.